"According to ancient Greek Drama, when life situations overcome the hero, it is called a tragedy. When the hero overcomes all situations, it is called a comedy. Imagine you would die unexpectedly and be able to look back at your life, your family, your relationships, your jobs, everything you have experienced. What would you be missing the most? Your car? Your work? Your money? Hopefully it would be your family, your friends and your loved ones? Would you consider your life a Comedy and say: "Wow, I had an amazing life." Or would you consider it a Tragedy, and say: "If I could only have done things differently." There is a positive place in everybody's heart where we have the ability to feel good about being who we are. When we relate from this space, we feel in love, peaceful, and at home; we experience inner freedom. Unfortunately this space is not promoted much in our lives in today's society. Expectations, stress, worries, and the accumulation of so called 'negative feelings' often predominate our way of living together on this planet Earth. The journey of this training will be the exploration of our loving hearts, our inner source. This is the foundation of our unique human potential. Transformation through the healing power of love will be the goal of this training. This Odyssey starts by looking at the questions: 'Who am I? How do I feel? What is important for me? Where am I going in my life? Together we will first focus on overcoming burdens we carry related to our past that hinders us to live our lives fully. We will discover what is in the way for us to open our hearts and practise expressing and sharing who we are. We will come closer to ourselves and others. Learning the art of letting go of negative feelings and resentments and start forgiving will get us in touch with our basic human needs, giving love, receiving love and finally experiencing self-love. This allows us to start relating to the qualities of our heart; gratitude, innocence, inner freedom and compassion. Accepting who we are in our heart, gives us a sense of completion. When we share ourselves in this way with others, it results in pure feelings of bliss. Then we realise that we too are Buddhas. 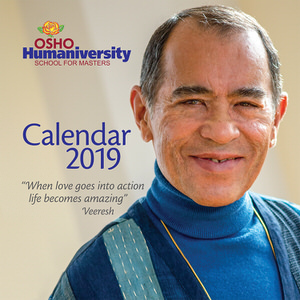 In this training I will include Humaniversity Social meditations, emotional expression and release, the Humaniversity AUM, Humaniversity Flushing, and different concepts of Humaniversity Therapy, all developed by Veeresh. I love the spirit of Zorba the Buddha and I look forward to sharing myself with you and offering you my friendship." Humaniversity Therapy is based on the Psychology of the Buddha's by Osho. This psychology states that every human being can come to total self-realisation in this life time by following the principles of love, awareness, and responsibility.